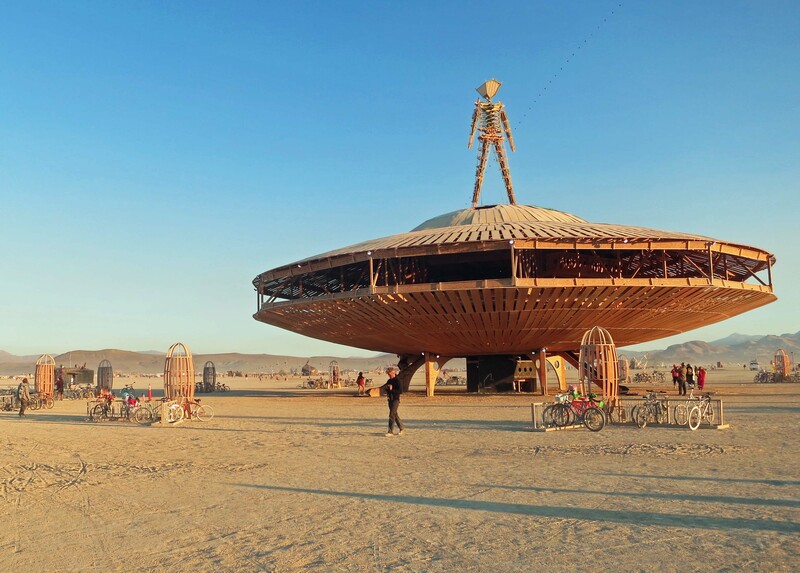 The Man of Burning Man 2013 perches on a flying saucer in the early morning sun and overlooks Black Rock City with its 68,000 participants. Soon, he will go to his fiery demise. It was three o’clock in the afternoon and I was in our van, Quivera, trying to take a nap. A block away a band was perched on top of a bus named the Purple Platypus singing lyrics that incorporated a generous portion of F words. The heat was stifling, as one might expect in the desert in late August. I had compensated by soaking my bandana in water, laying it across my chest, and directing one of our battery operating fans on it. I was rewarded with instant cooling and had almost drifted off when a longhaired James-Dean-rebel-type rode by on the bicycle he had modified to look like a lowrider chopper and fitted out with a hundred and fifty decibel boombox. Muttering one of the words from the Purple Platypus Band, I rolled off the bed and returned to my comfortable lawn chair outside. It was covered in playa dust that was now boiling up, driven by the heat of the afternoon sun and its accompanying wind. Dust storms are a common occurrence as the sun heats the air and winds start to blow in the afternoon. This photo is taken from our camp on G Street looking toward 6 street. Check out the handkerchiefs worn by the bike riders, cowboy-like, over their noses. I was grouchy about the heat, dust and missed nap but my irritation was lessened by the endless parade of costumed Burners who walked, biked and rode by our site on 6 and G Streets. We were in a prime location, just down from Center Camp. A huge church built by John so he could marry his girlfriend Muse dominated the block directly opposite from us. We were invited to the wedding, sort of. “Wear black,” the beer-filled John had directed. 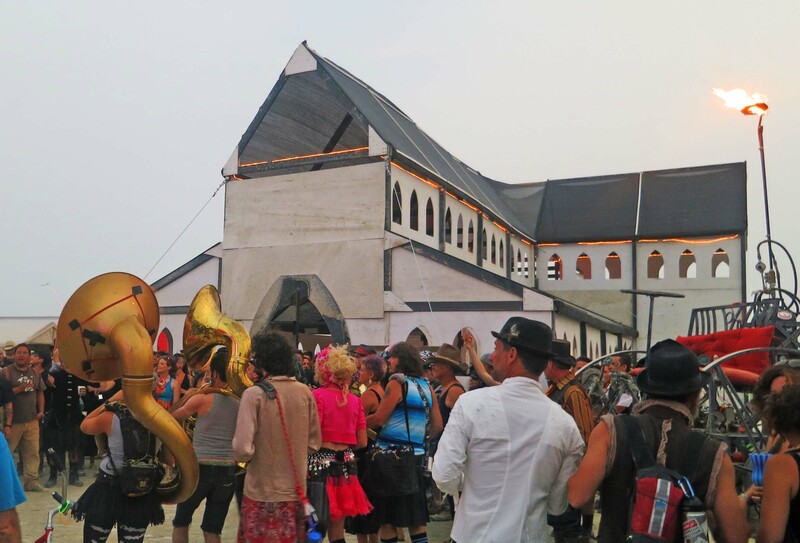 This is the church that John built so he could marry his girlfriend Muse at Burning Man. I took this photo just after the wedding. The church would come down at the end of the week. Bone and Bonetta were also married in the church. I will blog about both ceremonies later. An infinite number of port-a-potties lined 6th street, maybe 50 yards away. Having them nearby was both a blessing and a curse. It depended on which way the wind was blowing and how badly we had to go. 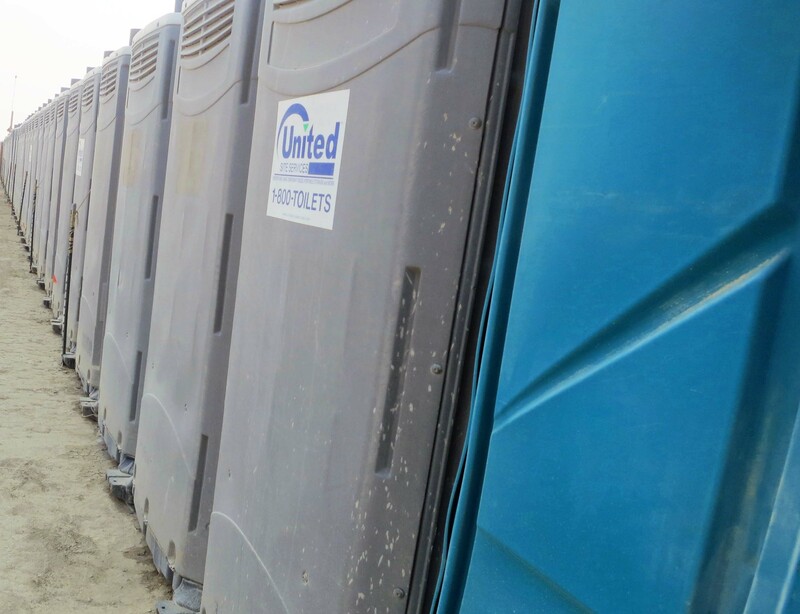 Large sewage trucks arrived in pairs every few hours to service the toilets. They came with long hoses and could empty 40 pots in ten minutes. Slurp, slurp, slurp. Burners with bursting bladders stood by with pained expressions while the job was done. A long line of port-a-potties lined Sixth Street just down from our camp on G Street. Women tend to be more sensitive about the condition of the port-a-pots than men and one Burner had discovered a unique way of gifting his fellow Burners. Each morning he would show up with cleaning equipment and station himself outside of one of the toilets. A long line of women would immediately migrate to his site. When each one finished her business, he would rush inside and clean the facility, making it ready for his next customer. 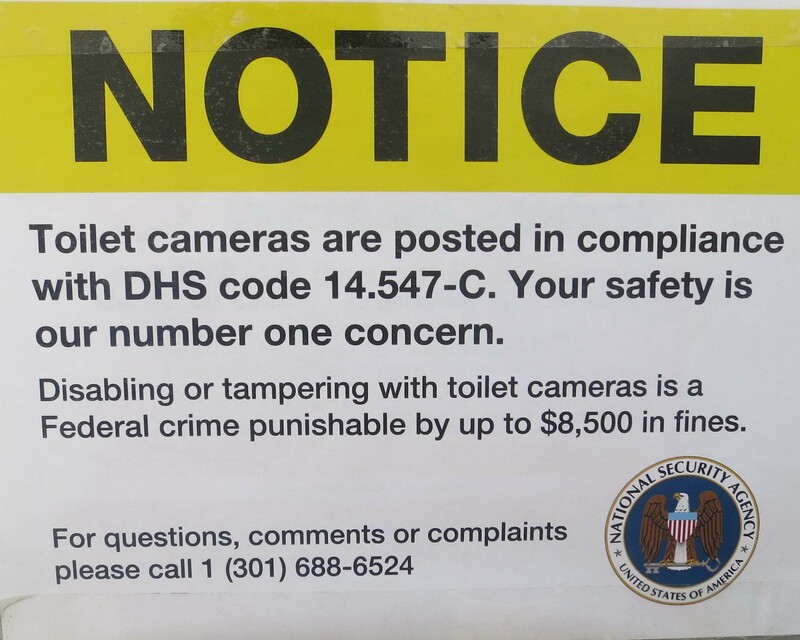 It was indeed a pristine pot to pee in. Enough on the pots except to share the two signs below that were humorously posted on the walls. 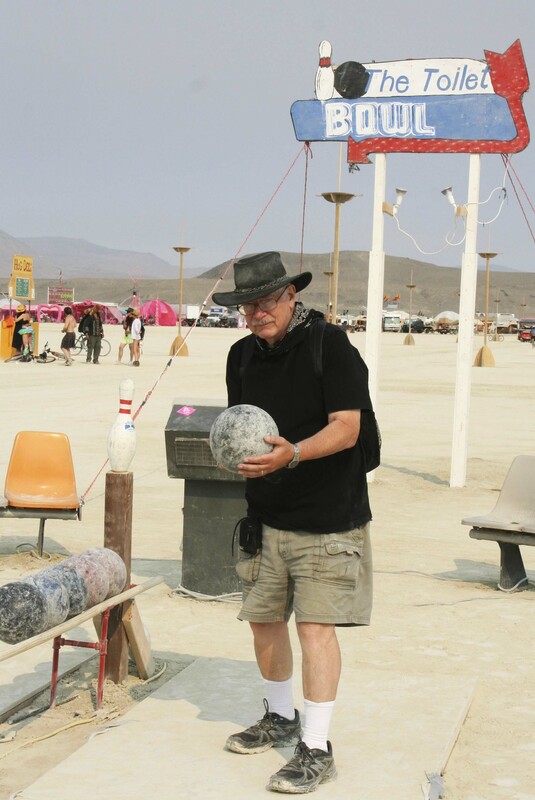 I will also note that I amused myself one morning by going bowling at the Toilet Bowl out on the Playa. 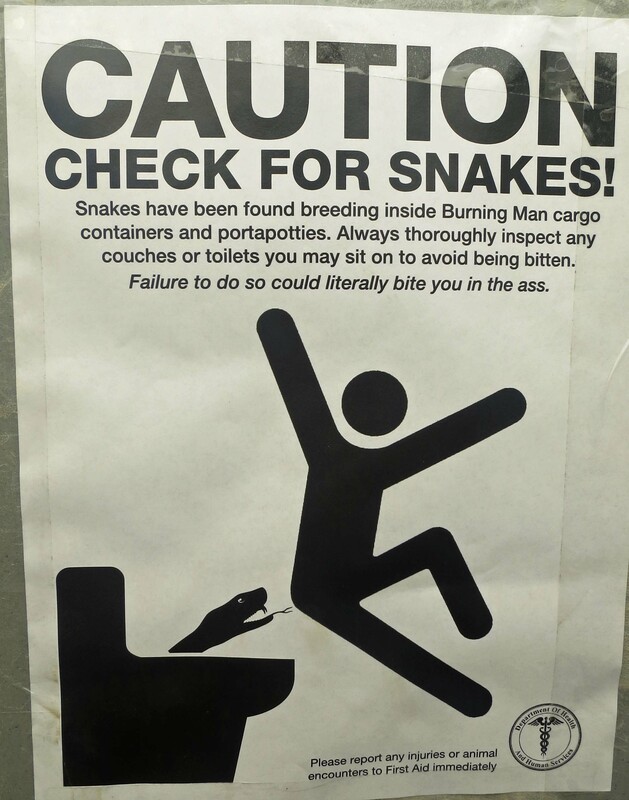 This sign warned Burners to be on the lookout for snakes that could be lurking down inside the potties. 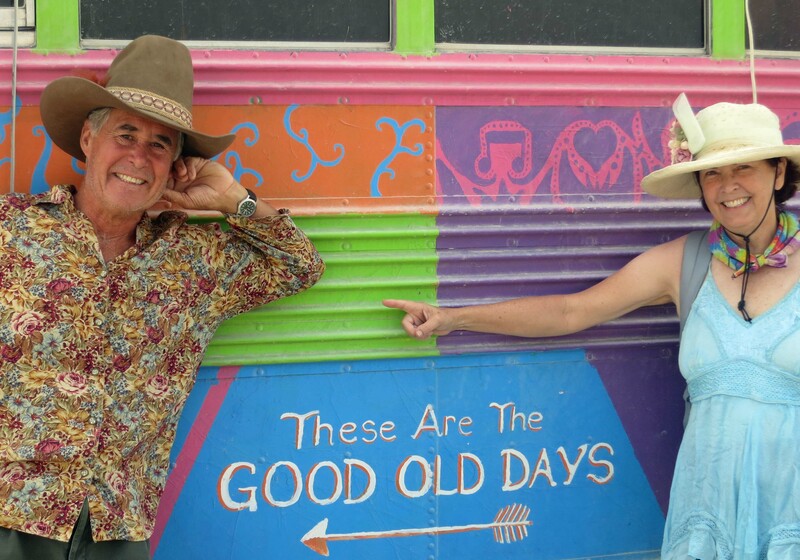 We had lost the fat, always-naked 60-year old man who had wandered by our camp several times a day last year. A skinny, always-naked 80-year old had replaced him. “How are you doing?” our camp member Adios, AKA Tom, asked, which of course was an invitation to stop by for a chat. But how in the heck do you maintain a conversation with a bone-skinny naked 80-year old? “What do you think about the art this year?” Tom asked while I smothered a laugh. The art, actually, was fantastic. 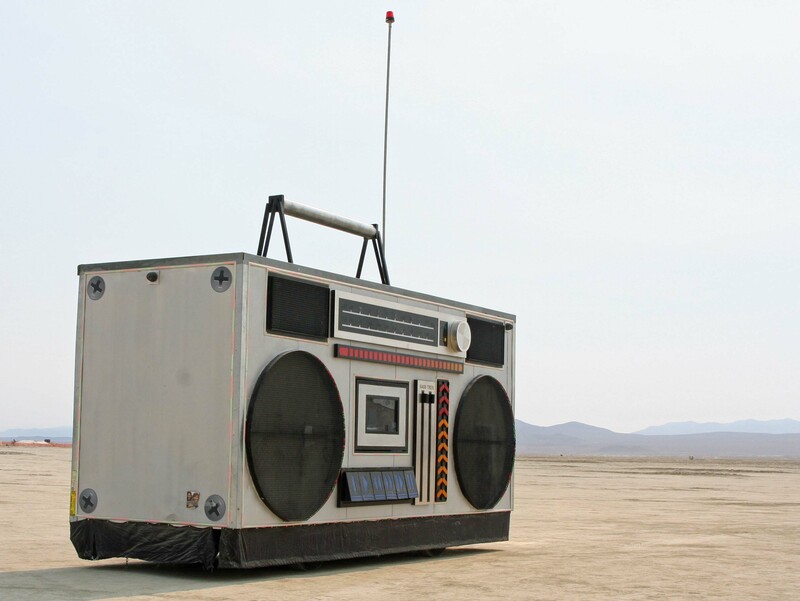 Over the next few weeks I will blog about the art, the people, the mutant vehicles, the burns and all of the other things that make burning Man the wonderfully unique event that it is. Join me. 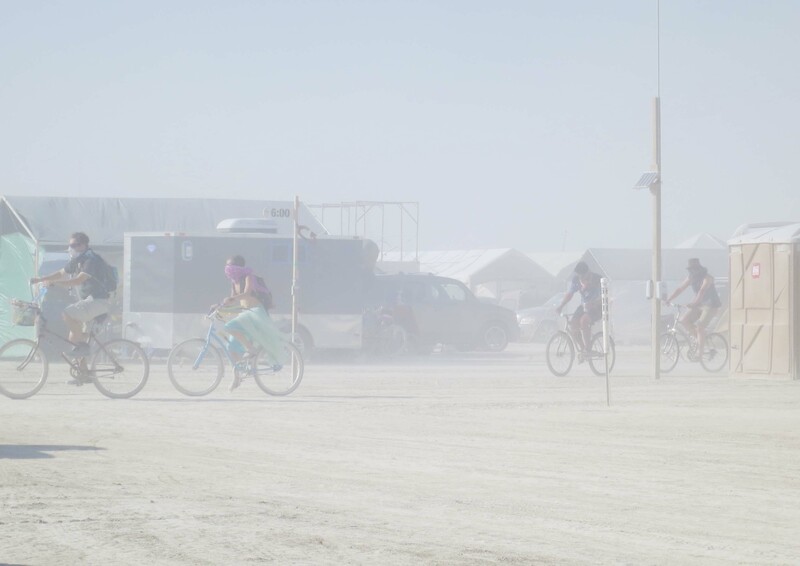 Next Blog: What do Burning Man, Star Wars and Joseph Campbell have in common? 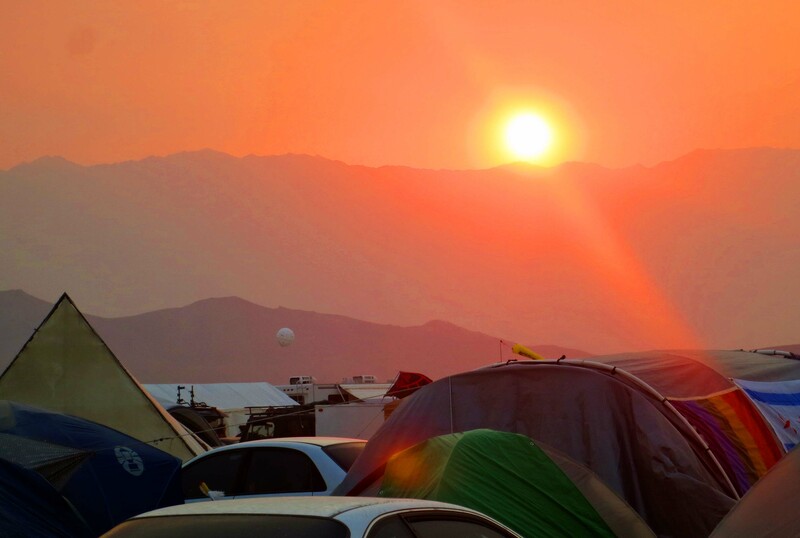 The sun sets on another day at Burning Man, a strange and sometimes wonderful event in the desert, almost guaranteed to challenge your concept of reality.